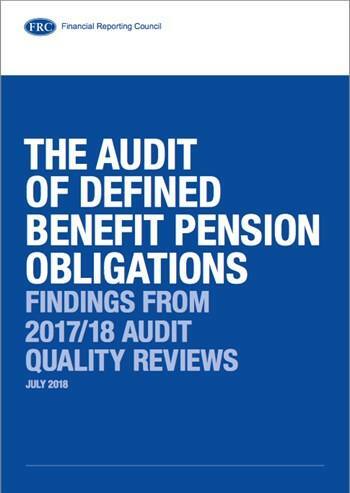 In December 2016, the FRC announced that one of the areas that its audit quality monitoring during 2017-18 would pay particular attention to would be the audit of pension balancesand disclosures. Our subsequent audit inspection work identi edboth weaknesses and examples of good practice which we feltwould be of benefit to auditors, audit committees and investorsto publish in a separate report. The FRC’s Corporate Reporting Review (‘CRR’) team has also completed a thematic review on pensions disclosures and published its report in November 2017. This report should therefore be read in conjunction with the CRR report. Why focus on the audit of pensions? For many companies with defined benefit pension obligations, whilst the net pension obligation appearing on the balance sheet may not in itself be significant, the related pension assets and liabilities are significant balances. The valuation of these assets andliabilities rest on a range of assumptions and management judgements and are at risk of material misstatement or manipulation through management bias. To demonstrate the impact of the assets and liabilities on the financial statements, the following table sets out for the FTSE 100 companies with the largest pension scheme liabilities, both the grossassets and liabilities, the resultant net defined benefit liability/asset (‘deficit/surplus’) and the level of materiality set by the auditor. As can be seen from the table, a misstatement in either/ both the pension scheme assets or liabilities could easily lead to a material misstatement in the net defined benefit liability/asset in the entity’s financial statements.